Jangsaeng Doraji are cultivated only in the foot of Mt. Jiri, which offers the most ideal conditions for Doraji. Unlike other crops that mostly grow in fertile soil, Doraji grow in soil in the most natural form away from humans. Jangsaeng Doraji are cultivated in over 50 hark of land several hundred meters aboveground. The conditions for drainage, amount of sun, and ventilation are most apt and ideal in Mt. Jiri for Jangsaeng Doraji to grow. In early July, flowers of doraji are in full bloom. These flowers, in full white and purple that is as pure as a fresh air, cover the entire mountain. However, these doraji vanish without leaving any glimpse once the soil in which they were cultivated is deprived of energy and spirits. No good manure or fertilizer would work to save the bellflowers. Below the ground where Jangsaeng doraji are is full of worms and other insects because bellflowers wither away in soil sprayed with herbicides or agricultural chemicals. A large portion of doraji get ruined in the course of finding pure nature by either getting scratched or finding the wrong soil. Oftentimes, half of the field cultivating doraji ends up getting lost, and less than three out of ten roots live up to more than 20 years. 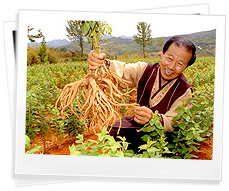 Cultivating Jangsaeng doraji is as hard as learning the principles of how they are cultivated as it takes 5–10 years before doraji are planted again in the same place where they were cultivated. This is more so when past doraji were cultivated in the same land for longer period of time. Jangsaeng doraji are cultivated with strict rules introduced and applied by Lee Sungho. Not only they need to be closely monitored and cared after based on their age of 3–20 but their cultivation records should also be kept as the data. 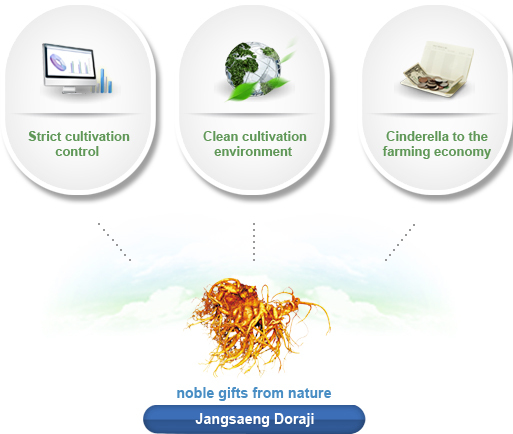 At present, there are 250 farming houses nationwide that cultivate Jangsaeng doraji, which not only help boost health but also support farmers. 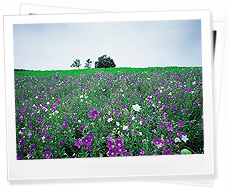 Bellflowers are cultivated on an idle land with the absence of other crops, but it can also help the growth of other crops when they’re planted on the same soil. Furthermore, these farmhouses are subsidized for cultivating doraji, which serves as a stable source of income because subsidy is usually 2–3 times higher than other crops and is based on total size of land used for cultivation, not the amount of doraji cultivated. 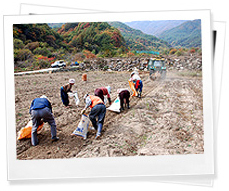 The annual subsidy amounts to KRW 600 million per 50 ha, and it is growing by year. The benefits of making high income on top of preserving mother nature by applying highly eco-friendly cultivation skills cannot be calculated in mere monetary values.